The added ingredient of a more evenly spread-out global middle-class with the means to travel the world has the streets of Russia dancing to a decidedly Latin beat. 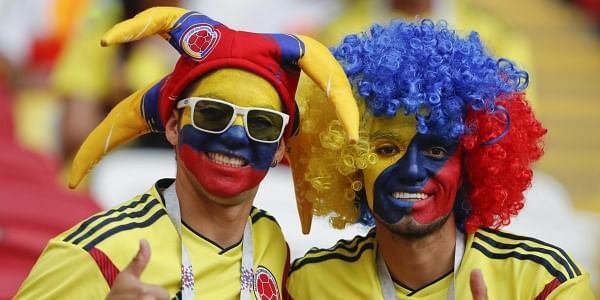 MOSCOW: Latin American countries have sprung a World Cup surprise by filling Russia's 11 host cities with tens of thousands of fans from Mexico and Colombia to Peru and Argentina. The contrasting cast of supporters at the biggest event in sport reflects Russia's progressive creep away from Europe in the 18 years of President Vladimir Putin's rule. Moscow is now embracing new allies that happen to worship football and where damning -- and often exaggerated -- media stories about Russian hooligans and poisoning cases are rare. "We didn't expect it to be this beautiful and the people are amazing," Mauricio Miranda said as he waved a Colombian flag on the edge of Red Square in Moscow. "We will definitely come back," said the 30-year-old. "I think Europeans are a bit afraid," the 46-year-old said while staring in the direction of Lenin's Mausoleum. "In Belgium, everybody told me I was crazy to go to the football." Yet FIFA figures showed almost 50 percent more Britons bought tickets for the African continent's first World Cup than this maiden one in eastern Europe. Fans banging Mexican drums and sporting the red-and-white bodypaint of the Peruvian flag encountered on a Moscow summer's day were almost all big city office workers. Colombia's Miranda is an urban planner with a new job in Canada. Alexandro Grado is a former financial consultant with Mexico's Citibanamex who now owns a plastics recycling firm. "Going to Russia is not expensive if you buy everything ahead of time," Grado said. "There are national teams which have very strong organisational support behind them. Argentina in 2010 was one example," said Ludovic Lestrelin of France's Universite de Caen in Normandy. "Those who travel to Russia and other places do not reflect the social makeup of French stadiums," said Lestrelin. "Those (in France) are more diverse, with a central core of lower and middle class workers." Zbigniew Iwanowski of the Institute of Latin American Studies in Moscow said Russia is further reaping the rewards of a "pink tide" that brought anti-US leaders power across the continent. "The pendulum has swung back to the right but they still have (Russian state media) like Sputnik and RT," Iwanowski said. "Russia's image is better in Latin America than it is in Europe and US." But the media's role in shaping public opinion -- and the reverse -- is all but impossible to gauge. De Munter said he often travels to watch Belgium play abroad. Rarely has he seen the national team's support so small. "We are expecting 4,000 Belgian people, which is not that much. Especially now because the Red Devils are doing very well." "I think our concept of Russia -– we feel that Russia is far away, that it's not a properly European country," the 28-year-old said.